Alberta musician Sam Lundell has grown up performing since age 5. Beginning in the classical music scene, and slowly absorbing inspiration from numerous genres and styles, Sam is now preparing to release his debut album this summer. After a couple weeks at Banff Centre for Arts and Creativity recording new songs for the debut album, the mixing and mastering process is in full swing! STAY TUNED as we put the pieces together for the album release in 2018. In the meantime, check out upcoming shows on the"Gigs" section of the SCHEDULE page - hope to see you soon! Sam Lundell "Everything" was selected as STORYHIVE Alberta's winning Small Town Music Video and now receives a Top Award of a residency scholarship to the Banff Centre valued at $10,000! The support we received from the local community has been overwhelming and was a definite factor in being selected the winner. 93.7 Wayne FM - "Playing All Kinds of Stuff!" And most importantly, our heart felt appreciation to all of you who took the time to vote, watch, recruit - this would not have happened without you !! "Everything" is now available on iTunes (as well as most other digital media) so please grab your own copy to continue your support. Lloydminster area resident Sam Lundell recently completed his first music video for his original song "Everything", which is set to be released July 18, 2016. Sam teamed up with Edmonton filmmaker Justin Brunelle and cinematographer David Baron (formerly of Vermilion) to create a thought provoking and inspirational video that chronicles a young woman's journey of self-reflection on a life-changing hitchhiking trek through Alberta's countryside. The Sam Lundell Band's energetic and passionate performance drives the video's message of finding freedom and love in what seems to be the darkest of times. This collaboration was possible as a result of a grant from TELUS Optik™ TV’s STORYHIVE, which awarded $10,000 to 17 Alberta and British Columbia Artists. STORYHIVE is a production funding and distribution competition for emerging content creators in western Canada ( www.storyhive.com ). After being approached by Brunelle, Lundell reviewed Justin's portfolio and knew immediately that this partnership with Justin and his team at Moving Artistry Productions would be brilliant. Lundell recalls, "Justin's previous work resonated with me; his eye for lighting and nature captured my vision for telling this story." Following an all-night filming session in the forest, multiple stops in numerous Alberta towns and cities (including Vermilion and Islay), hours of production and editing, both Lundell and Brunelle are thrilled with the outcome. "I am very pleased with the end result and look forward to sharing this story. I am anxious to hear people’s reaction to the song and what questions they ask themselves as a result," says Lundell. "In addition to the funding we received through STORYHIVE, I am thankful for all of the project support from family, friends, volunteers and the behind the scenes crew who made this all possible." PHASE 2 of the grant competition opens the video for public viewing and VOTING from July 18-22. Based on voting results, social score and professional evaluation, the STORYHIVE Jury will award one music video an additional Top Award: a residency scholarship to the Banff Centre for the Arts (valued at $10,000). Anyone may cast one vote per day for "Everything" on STORYHIVE. Scenes" coverage and to find complete VOTING INSTRUCTIONS. For further information and inquiries, call Sam at 780.214.5067 or email info@samlundell.com . Hello Friends! Welcome to the “About” page. 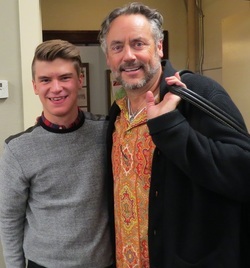 2015 ended in a real whirl-wind - I was blessed by W. Brett Wilson with several performance opportunities in Calgary alongside other amazing Canadian acts such as Brett Kissel, Tyler Vollrath and Tenille. Thank you so much to everyone involved with those shows and to Brett Wilson for inviting me into such an amazing experience. Looking forward to 2016, I am beyond excited for all the projects I have my hand dipped in - digital content including Music Videos, Talk Shows, (and maybe some vlogging if I get my act together), as well as finally making a Sam Lundell record. For real. It's happening. 100%. This year. #SamLundell2016. I know my description is somewhat vague as to the plans for this year, but it's still early, so please subscribe/follow on any social media outlets you utilize to make sure you have the most up to date info on all content I'm helping put out. (all links are on the bottom left of your screen). Thank you for reading this far. If you want more info as to my musical background, or would like to book a show, please see below. I'm so looking forward to interacting with you throughout this year! If you've followed me for a little while, thanks for all your support; if you found me by accident, I'd love to hear from you! CHECK OUT the "Schedule/Gigs" page for upcoming performance details - hope to see you there!! Sam would be thrilled to provide musical entertainment for you at a concert, festival, charity event, community event or a private function so feel free to give a call (780.205.5504) or send us an email to hello@samlundell.com and we can discuss the details! PRE 2015 - Sam began his musical endeavors studying violin at age five and eventually became a student of former Edmonton Symphony Orchestra Concertmaster, Martin Riseley. Prior to 2013, Sam’s musical highlights included “Sam Lundell and Friends” musical fund raising concert which raised over $10,000 for Haiti and Ecuador; performing on Saskatchewan’s Telemiracle live broadcast; and probably the most exciting was, at the age of 13, having the opportunity to share the stage with Grammy Award winning indie-rock band Switchfoot and his musical idol, Jon Foreman. Also in 2013 Sam had the privilege of being an opening act for High Valley at Lakeland College’s “Band in the Sand” concert. In addition, he played Lloydminster, Alberta’s “Rock the Border” music festival and Hope4More festival. 2014 was focused on high school graduation, the final year of dance competition (http://www.famedancestudios.com/), successfully completing the Grade 10 RCM Piano Examination, writing new music and sharing his talents as often as possible. Throughout 2015 Sam continued to work on completing original tunes for recording, as well as performing at a number of summer music festivals for the first time under the banner of the Sam Lundell BAND (with musicians Mark Stetson, Tim Donily, and Luke Mattheis)! Sam also competed in a couple of 2015 talent competitions and advanced to the FINALS at both the Ponoka Stampede and Calgary Stampede talent search competitions.